I rarely do non-makeup haul posts on the blog and have even reduced the frequency of makeup hauls. But I was excited with some of the items I got these last two weeks so I thought I share with you guys. 1. 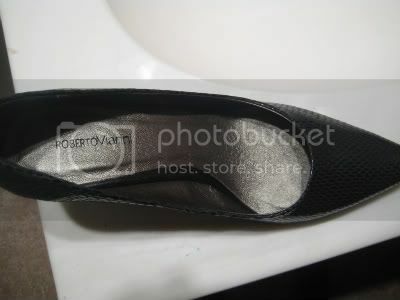 Joneve: I scored two pairs of Roberto Vianni shoes from Joneve. This brands shoes are generally in the $200's range but they were having a mega sale so I got both pairs for $100 taxes in! I love me a good sale! This pair I'm planing on wearing to my company christmas party tomorrow. They also had it in red but I have enough red shoes I thought I get it in black. I have a weakness for lace so I was giddy with excitement when I saw this. 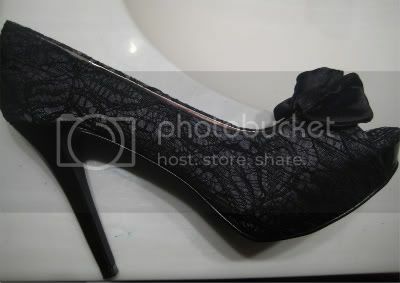 I got this pair coz I just wanted a pair of basic black pumps that didn't look boring and these fit the bill. 2. Bedo: I got a new winter coat from Bedo when I was in Montreal two weeks ago. Living in Canada, you gotta have a variety of warm coats. I tend to splurge on a new one every year. This number is very warm and I love the collar, you can button it all the way up. I like to wear this with a black cable circle scarf (which I'm not doing in the pic). Hauled anything lately? Feel free to share in comments. 5 Responses to "A Rare Shoes/Clothing Haul Post"
your new coat is absolutely divine! Lovely items! I love a good sale as well. Thanks so much for sharing.